Our beautiful Custom Fabric Labels are soft, double faced satin with a silky smooth texture, printed with rich color with high definition. Our full color clothing labels are ideal for small business and startups as we have no minimum order. You can design your own fabric labels for craft projects and handmade knitted items. Easy to design online, so print your own custom sewing labels with your brand name or logo. We print full color personalized sew in name labels for your brand. 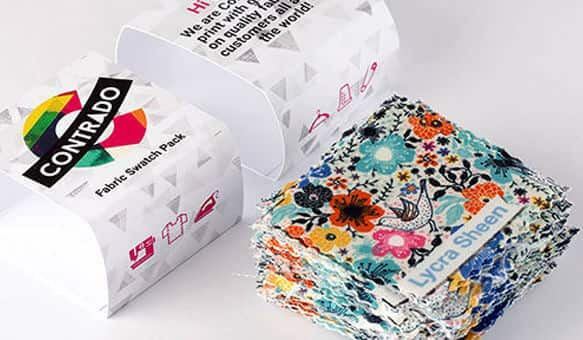 Build your brand with our colorful fabric labels. See our ready printed Fabric Label Sample Set. A big problem you will face finding a labels supplier, is minimum run size for custom labels especially full color custom tags for clothing. 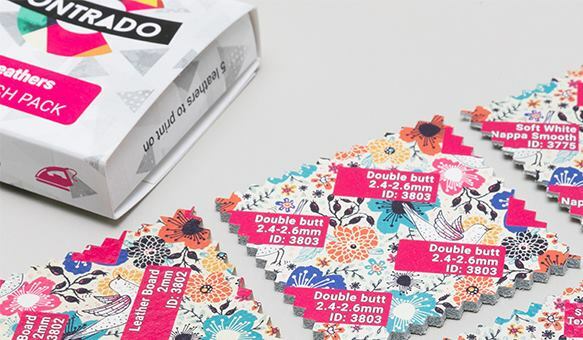 If you only need a small quantity of fabric labels for handmade items, they often start at 1000 or 5000 labels and will cost a small fortune. You won't need that many at the beginning so why put that much cash into stock? Custom name tags also change. 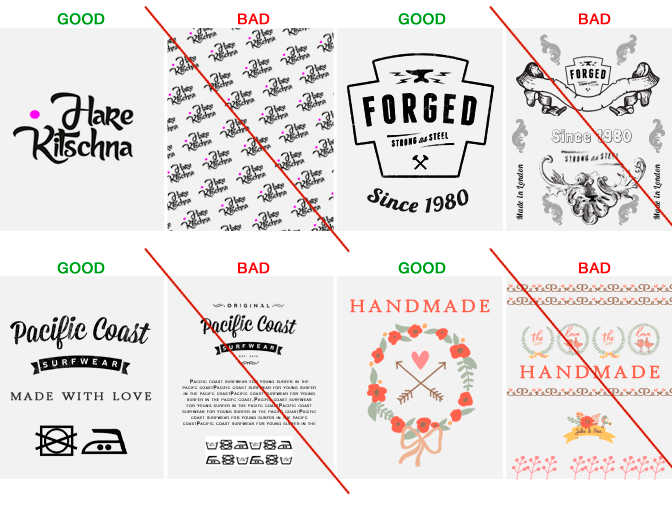 You might find you need to edit the design or adjust the tag name and that will be a terrible loss if you make a bulk order. Best thing to do is to make name tags in short run, especially useful as personalized fabric labels for crafts, handmade and knitted items. Our minimum quantity is 1 pack and we can print as little as 20 labels hand prepared for you. This helps you get it right in the long run. Use us for trying things out and we will help build your brand. We sell our handmade labels in packs of 20, 40, 100 & 200 labels (and we always add a few extras). 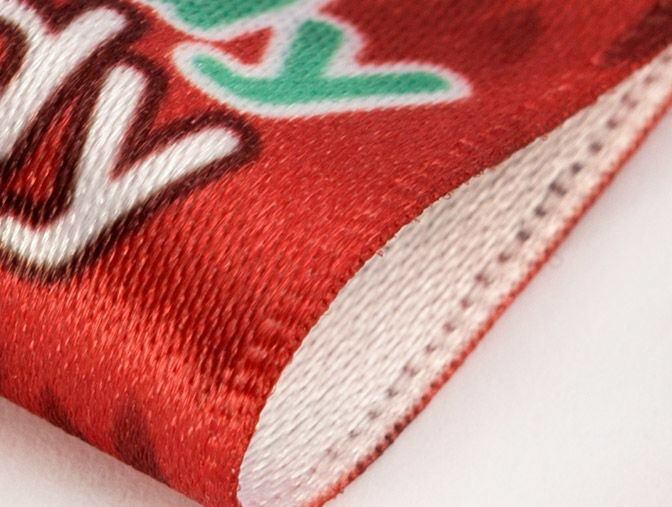 Please note that included in your design is a 0.4" seam allowance at the end of the label, where it will be sewn. Please do not use this area for a design, as it will disappear when you start sewing. Please also note the 0.12" bleed area in the design interface. 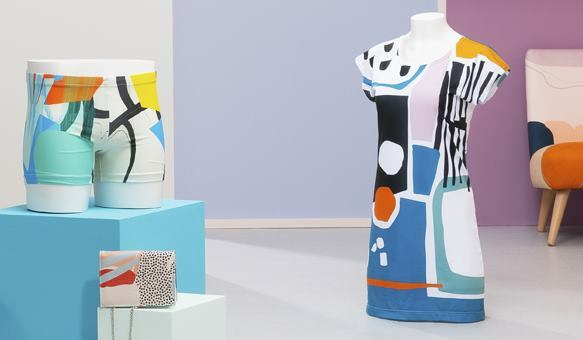 Please note, we use a woven satin fabric, but your labels are printed on, not embroidered. This gives you the greater advantage of excellent color print, full brand logo and a better readability for small details. Awesome Fast and exactly what we needed and price is right. Beautiful! The product was better than expected. Great quality, great price point. I would definitely order again and again. Plus, the shipping came sooner than expected. Very nice labels My logo was printed just as I had provided and I absolutely love the labels. Great quality and shipping was super fast. Loved it We couldn't be happier with the labels we ordered. Thank you for being accurate and FAST!! regrading order the garment tags were longer than expected. The imaginary line makes it seems you can't go pass it. WONDERFUL Experience! The fabric tags I ordered were better than expected - the print quality was fantastic, and the materials were an excellent quality. Plus I had them just a few days after ordering, which was a major plus! Would definitely recommend! SO extremely happy!! The services we’re beyond quick considering I am in the US and Contrado came from the UK, I am SO beyond impressed. The packages came so quick, it was the most affordable (after a few days of price comparisons- oh and designing a million different tag templates...) Contrado was beyond the best price for quality and shipment timing. I would really recommend!! You get notified throughout the whole process, and the communication is so key to me.. This service was so on it, I got notified package will be arriving at/before 10:45 am at my house. I got a knock at the door at 10:43 on the dot with my package... Still shocked at their services and I will continue for as long as I have any sort of reason to not!! pleased with the final product sewing labels with the company name and logo. The shipping was unexpectedly quick, and the labels are great quality beyond my expectation. Love it! Great quality, so professional looking. I wish they came end-folded but it was not a problem. I want to do a re-order for more! We have 2 options: 1. Folded: Has a closed edge and the cut edge is to be sewn in. If you need a folded label this is ideal. 2. Flat: Has heat sealed cut edges. The ends are meant to be folded as we don’t achieve a skin side finished edge, it’s just sealed to be non-fray. All the flat labels, or custom fabric tags, have + 0.4" seam allowance added to each side (on top of the stated fabric label size). You can sew flat with no fold, and probably best if you scissor cut our edge off, but there will be risk of fraying. Can my all of my care instructions fit on a small label? Small labels only have room for a logo. For care labels with lots of instruction text, we recommend opting for a larger customized fabric label. Take case in making sure that you have chosen the right size label, as scaling down the logo to fit can often make the text illegible.